MÒD IONADAIL GHALLAIBH AGUS CHATAIBH 2012 - INBHIR ÙIGE, GALLAIBH. Wick busy for the weekend of the Caithness and Sutherland Provincial Mòd. "Wick must be very busy on the Jubilee weekend" - that was the opinion of members of the local organising committee for the Caithness and Sutherland Provincial Mòd in Wick on Saturday 2nd June. Accommodation in local hotels in the town was at a premium for late enquiries made to committee members from visitors to the county from all over Scotland. Visitors are looking to compete in competitions as well as simply return to the county for the festival atmosphere following the successful national event in October 2010. Mary Ann's will open on Friday 1 June and will be staying open thereafter for the season until the end of September. Open 2.00 - 4.30 pm every day. Volunteer guides always needed - just come along. Ship a’ Hoy - Sunday 27th May 2012. 10.15am – 6pm. This is your only opportunity to sail directly to the Orkney Island of Hoy from the Scottish mainland on the Pentland Venture passenger ferry from John O’Groats. Either enjoy yourselves independently exploring Rackwick Bay or join the Countryside Ranger walking out to the famous ‘Old Man’ sea stack. Previously on route whales and dolphins have been seen and on Hoy we may see mountain hares and nesting great skuas. Walking gear and packed lunch needed. Numbers limited so booking and pre-payment by 20th May is essential (credit/debit card booking available). Costs cover ferry crossing, buses and ranger event charge. £40 per person (no concessions). With the demolition of the house known as Dr Leasks we thought it might be time to look right round the High Street and make record of the shops as they are now. There are new ones opened recently and one or two more on the way as can be seen from the new paintwork. THIS was the proverbial game of two halves...the second containing the entertainment and more important the goals for the home team. The first half was a lack-lustre, slogging, affair with the Scorries scorning the chances that came their way which might have returned to haunt them had the Coasters managed to emulate Wick's second half form. It was 16 minutes into the second period before the fans began to get value for their admission charge, Sam Mackay slamming home the opener after a fine solo run down the left. Stewart Ross made it 2-0 after capitalising onto a ball that broke to him, a few minutes later and Richard Macadie compounded the visitors' misery by adding the third to the score sheet, close to time. Again in the second half, chances went abegging and Academy could have doubled their final tally could had they been taken. In order to create better links with parents and to make parents aware of the support available to them, Norlin Playgroup, Wick North Nursery and P1 are holding an information day for early year’s parents, on the 15th May 2012 from 10am – 4pm. The aim of the information day is for you, as parents/carers, to become aware of the services that can support families and to access information about healthy life styles. You will also be able to receive information about the Curriculum for Excellence and the life of our school in the wider sense. Staff from P.1, nursery and the playgroup will be available; if you have any questions regarding present or future information with regards to your child’s education. 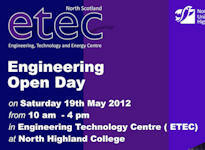 We would be delighted if you could support the day by coming along. The information day is also for families outwith our school, please feel free to take extended family and friends along as they will also benefit from the information day. There will be tea and coffee available for adults, milk and juice available for the children and face painting will also be available. If the day is successful we will make it an annual event, please feel free to offer feedback to staff after the event. Visitors to the Wick Diamond Jubilee HarbourFest will have the opportunity of sporting a specially designed tee shirt for the event. Featuring the latitude of Wick Harbour, 58° North, the name of 'Wick' in marine signalling flags and a red, white and blue yacht, the tee shirt is expected to be a great hit with both children and adults. 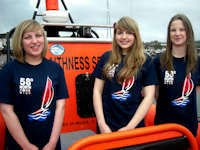 The tee shirts, costing £9.99 each, are available in four sizes and make ideal presents to those living away from Caithness and in addition to Reid's Pharmacy, can be purchased from the following outlets in the town - - Malcolm's Newsagent, Kinnaird Street; the Blythswood Shop on High Street and the Wick Harbour Office.